Once again, Callaway Digital Arts has taken a beloved children’s book starring Sesame Street characters and turned it into a digital edition for mobile devices. Once again, Callaway’s efforts have produced a winning e-book for the iPhone and iPad that should delight young readers. And once again, that delight will come in spite of some lagging performance issues with the app. C Is For Cookie Thief: The Great Cookie Thief is a pretty faithful adaptation of the classic kids’ book, with some nice interactive elements thrown in. 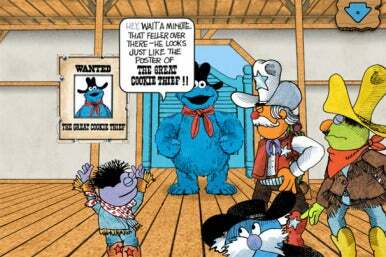 The Great Cookie Thief debuted as a Sesame Street sketch in the 1970s and became a children’s book shortly thereafter. It’s now available for the iPad and iPhone, adding some tappable interactive elements to augment the story. Readers are asked to help identify the Cookie Thief by tapping on clues that match the wanted poster. In a particularly clever touch, the story adapts to the clues you select—tap Cookie Monster’s googly eyes, for example, and that’s what the characters will talk about. All the elements that made past Callaway adaptations The Monster at the End of This Book and Another Monster at the End of This Book so enjoyable on iOS devices are on display here. The text appears onscreen and is highlighted as the characters speak—a good feature for young kids just learning to read. Linger on a page or tap one of their characters, and they’ll speak a line that isn’t necessarily in the script. And the music is spot-on, something that Ennio Morricone might have composed had he worked primarily with muppets instead of Sergio Leone. Unfortunately, the same performance problems that dogged the two Monster apps are in evidence with The Great Cookie Thief. When you tap to turn a page, there’s a noticeable lag before the new page loads. How noticeable will depend on what device you use. On an iPad 2, it was just a few seconds. On an original iPad, it was a much more noticeable gap—so noticeable in fact, that my daughter would start repeatedly tapping the tablet in frustration as we waited for the scene to load. I appreciate the high degree of quality Callaway brings to its mobile adaptations, but I wish the developer would be more mindful that its target readership is not an age known for its patience. 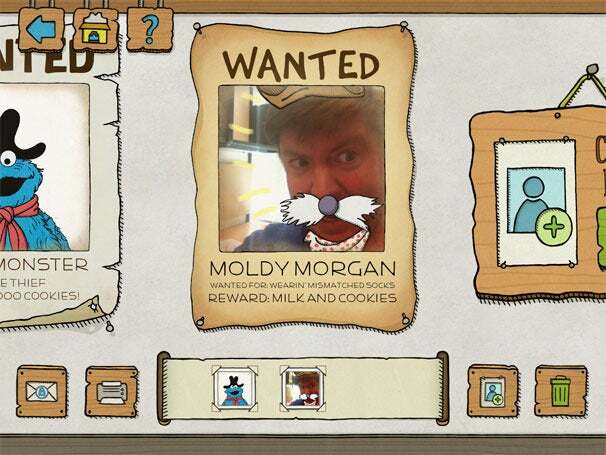 I Want You to Want Me: You can create your own wanted poster in The Great Cookie Thief, using a character from the book, an image from your camera roll, or a photo you’ve shot with the camera on your iOS device. There’s also an activity center in The Great Cookie Thief where kids can create their own wanted poster. You have the option of using an image from your photo library, one you take with your iOS device’s camera, or one of the characters from the story. (The app only makes two available, and offers three others as separate 99-cent downloads—a little disappointing given that this is an app aimed at small kids.) The drawing tools and stickers are pretty basic stuff, but it should please 5-to-8-year olds. (Pro Tip: Selecting the Free Play option in the character gallery gives youngsters a blank canvas on which to draw.) The controls could be a little more intuitive—it took a little experimentation to figure out how to get rid of unwanted stickers—but the wanted poster creator is a nice addition to the app. The Great Cookie Thief isn’t a perfect app, but the preschoolers and elementary school-aged kids the ebook is aimed at are unlikely to care (provided they’re reading the app on a recently released iOS device). What they will care about is some fun times with Cookie Monster; the app more than delivers on that front.